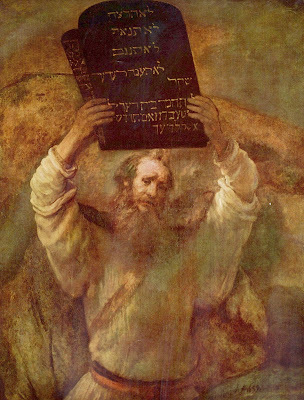 This remarkable Biblical statement points out one of the unique facts about Judaism: Judaism is based on a mass revelation, not a private revelation, therefore making it far more credible than any other religion. Furthermore, the author of the Bible somehow knew that never again anywhere else would such a claim be made. This was a one time event in world history. Some people have claimed that the Aztecs had a similar myth, however this is incorrect. The Aztecs did not claim that our Creator spoke to millions of people. The Aztec myth concerns Huitzilopochtli, who was a god of war, sun and human sacrifice. He sometimes appeared in human form. According to the Aubin Codex, the Aztecs originally came from a place called Aztlan. They lived under the ruling of a powerful elite called the "Azteca Chicomoztoca". Huitzilopochtli ordered them to abandon Aztlan to find a new home. Huitzilopochtli guided them through a long journey. Also, the Aubin Codex is one book currently in the British Museum Library. It was written by an unknown author in the Aztec language in 1576. We don't know how many Aztecs actually knew of this story or believed it. In How to Read the Bible, by James Kugel, he proposes the possibility that King David used the idea of national revelation to unify the tribes. He says possible that a small group had the story, but he expropriated it and applied it to everyone. As he was the King and had divine connectedness implied in that role, who was to tell him he was wrong? He was just reminding them of something they used to know. He likens it to the story we have today that the colonists were seeking religious freedom when they sailed for America. Some were, up north. But if you asked the southern colonists they would have looked at you like, “huh?” Now, kids everywhere learn that this was a main reason for the colonists seeking independence. The particular story spread to include everyone. What do you think JP? You should check out the book, would appreciate your take. Professor Kugel is a frum Jew too. But not a baal t’chuvah I believe. If so, then why doesn't any Jewish text mention David's revelation or discovery? The four authors of the Gospels are well known and respected by Christians. The same is true in Islam regarding the authors of the Hadith. I think that this all has to do with dating. King David is approx 1000 BC (very roughly), and according to James Kugel, the Torah is an anthology that started to form I think around five hundred BC and something like one hundred BC was realized in its final form. I think for Kugel the Torah is a process of hundreds of years and then at some point – newsflash – it is anthologized by someone or someones and then later – newsflash – it is seen as having divine importance and giving lessons for all people at all times, is cryptic and requires interpreting, is the word of G-d given to Moses on Mt. Sinai, and I think one more thing. Kugel calls these the “four assumptions,” that got started in the mind of interpreters hundreds of years removed from the text’s beginnings, and then later anthologizing. It’s the academic view: hundreds and hundreds of years and then people believe what they are holding is divine. And for the ancient Jews, it becomes subject to a whole new kind of interpretation, and any contradictions are seen as cryptic messages. If you want, just read his first chapter, and then skip to what I think is the last chapter, “After Such Knowledge” or something like that. The rest of the book is good, but probably better to read in chunks. It is a long book. There are also some critics who write well about the book: someone named Sommers I think, and then Kugel responds to Sommers with an essay called “Biblical Criticism Lite.” These all helped me sort of skip boring things and focus on the main arguments. Professor Kugel does actually speak at Orthodox synagogues sometimes, though I’m sure Haredi ones would have nothing to do with him. He did give a talk at Yeshiva University once, invited by a student group, but it was criticized by many Orthodox. I think his invites are mainly to Modern Orthodox places. Probably like Natan Slifkin, Professor Marc Shapiro at Scranton, and Menachem Kellner (all frum like Kugel), they can only be tolerated by Modern Orthodox audiences. "I think for Kugel the Torah is a process of hundreds of years and then at some point – newsflash – it is anthologized by someone or someones"
If so, then why doesn't any text mention this someone or someones? The four authors of the Gospels are well known and respected by Christians. "Professor Kugel does actually speak at Orthodox synagogues sometimes"
If someone were to say that, around 1820, Extra terrestrials visited the United States, communicated with everyone, turned the Mississippi river into blood, gave the Country a new Constitution, and all this was written down, and became the official history of the country, I for one, would be supprised if anyone believed him. So how did anyone manage to convince the Ancient Jews that similar things happened to them ancestors? There are different kinds of "knowledge", and sometimes people don't agree on what the basis of that knowledge is. The beliefs promoted by this post, as "proven" by the Kusari argument, are "revealed" knowledge. This is knowledge based on tradition, collective ancient wisdom, and holy men. Until 200 years ago most knowledge in the world was of this sort. Since the enlightenment and scientific revolution, revealed knowledge is no longer a priori, assumed to be true, and is subject to challenge by empiric observation and the scientific method. This is an entirely different way of learning about things. Not everything of revealed knowledge is automatically wrong, and scientific knowledge is not always right. However, the past 200 years have shown many successes of the scientific way and has, in many (but not all) cases, replaced revealed knowledge. In this context, for a believer in revealed knowledge, the "kuzari" argument makes good sense, whereas for the scientific skeptic it is a completely invalid form of proof due to circular reasoning, among other flaws. This dispute can NOT been "won" in a debate. Rather, it is for cultures and society to determine, by asking themselves, "do we want to be governed by, or rely on, religious principles, with its revealed knowledge, or scientific principles, or both?" Either God revealed Himself at Mount Sinai or He didn't. You can't say "For me He did, but for you He didn't." Furthermore, science seems to be disproving rather than supporting atheism. "Furthermore, science seems to be disproving rather than supporting atheism." Anybody that has the slightest understanding of science (not just some scientific "facts" that you may know) wouldn't make such an absurd statement. It would be like me telling a rabbi that "Judaism actually says that God doesn't exist and that murder is good", based on some hand-picked, out of context, scriptural quotes. Don't tell me what science says because you don't understand it. As far as I know, you have no qualifications to selectively apply science to support whatever happens to agree with your view. From what I have seen of your posts on the matter of evolution, your claims are totally bogus. And, yes, I am using a perfectly valid form of informal logic, argument by authority, on the subject at hand. "Either God revealed Himself at Mount Sinai or He didn't. You can't say "For me He did, but for you He didn't." Yes I can. Its a matter of interpretation of historical events and experiences, and turning it into a narrative. 2. A Naqba, a catastrophic ethnic cleansing of defenseless and innocent native inhabitants, who were willfully murdered or expelled, and perpetrated by a cunning Judeo-Christian conspiracy? "Don't tell me what science says because you don't understand it." Why don't you explain it to me. "Its a matter of interpretation of historical events and experiences, and turning it into a narrative." Well, I suppose you might be follower of Bill Clinton who, when caught lying, explained that it's all a matter of interpretation. "It depends upon what the meaning of the word 'is' is. If the—if he—if 'is' means is and never has been, that is not—that is one thing. If it means there is none, that was a completely true statement". So everyone's right, depending on what the words mean. Sorry to say, JP, but there is no such thing as absolute truth. You're a big boy now, so deal with it. There ARE facts, but what they mean is interpretation. "why don't you explain it to me"
I don't have to. Experts have done quite a good job explaining evolution. But they don't address the question of God. They couldn't possibly do that. Just like they study gravity without considering god. God is a factor not even considered in science. If it assumed god it wouldnt be science, because you couldn't use scientific reasoning, such as statistics or induction. So saying that "science is disproving atheism" as absurd. Nat, try making it 1620 and not 1820, and then, please insert a clause that whoever is not a believer is subject to all forms of excommunication and even death. Then see how many people suddenly find your scenario perfectly rational. "There ARE facts, but what they mean is interpretation. " I can shoot heroin and when my doctor tells me I'm going to die I'll smirk and explain "There is no such thing as absolute truth. You're a big boy now, so deal with it. " "Experts have done quite a good job explaining evolution. " "But they don't address the question of God." "although atheism might have been logically tenable before Darwin, Darwin made it possible to be an intellectually fulfilled atheist." What difference does the date make? If someone would tell you that extraterrestrials visited the Earth around 1620, everyone saw, and it was written down, would you believe him? And why woudl excommunication make it any more believable? The most it would do is make people keep quiet about their doubts? And there are always people who are open to new religios ideas, like the early Christians, as long as the ideas aren't so readily falsifiable. Right Nat. And if I'm quiet about my doubts, chances are my children and their children will not think I have any doubts at all and will completely believe the alien stories 100%. That's how the alien story will be passed down from generation to generation. You don't actually need to go far to see this, just check out how many adults grew up in communist russia believing that Lenin and Stalin were messianic leaders and that utopia is here and it is russia and every other country, like America, is a poverty-stricken hell hole. Whole generations believed the crap communist leaders invented, because... the alternative was death. Let's put it this way. If I have to choose between a biologist's expert intepretation of the evidence and your silly commentary, please don't be insulted that I choose the former. Only a fool would opine on something he is not qualitified to give an opinion on. Without getting too distracted by the details, I return to my earlier comment-- that we're talking about two different systems and methods of knowledge. An old one and a new one. Your "facts" are derived from an old method of acquiring knowledge, which is different then the scientific method. That you can quote scientific "facts", about fossils or some physics law, does NOT mean you are using science. A good analogy is Chinese medicine. Its derived from a combination of tradition, experience, spiritual beliefs, not by scientific methodology. You can ask the question, "are Chinese medicine theories factually true or not?" or "does it work or not?" in a yes/no fashion, but in doing so you miss the point. At least in part, its "truth" is derived from the very fact that people believe in it. "Only a fool would opine on something he is not qualitified to give an opinion on." Well, then atheists such as Professor Dawkins are fools as well. As Dawkins put it "Do you have to read up on leprechology before disbelieving in them?" As he dismisses theology as clear nonsense, I dismiss evolution. "What happened was that much of the early basis for religious belief wasdissolved by science. It wasn't that scientific discoveries made religion impossible... it'sthat they made irreligion possible. It became possible to understand how things workedwithout the religious explanation and particularly, I think, more important than anythingany physicist did, was what Darwin did, Darwin and Wallis." "Your "facts" are derived from an old method of acquiring knowledge"
I'm using the same methods every rational person uses in making life decisions - research, facts, logic. Lost of people had doubts about Lenin and Stalin. That why nobody belives in them now. that didn't happen with the Torah. "Either God revealed Himself at Mount Sinai or He didn't. " best comment by JP. Ever. Lots of people had doubts about Stalin and Lenin. Then they were killed or sent to Siberia. Their children had no more doubts.Plenty of people still believe in that crap. And as for non-belief in the Torah, Nat, please look around yourself. The percentage of Jews that is Orthodox is miniscule. I would like to propose a theory that in fact there was a fire and smoke on top of mount Sinai possibly caused by a lightening storm. And perhaps the people had never experienced a lightning storm before and perhaps it was a very terrifying experience and they interpreted as a message from God. And the leaders at the time probably continued to remind them of the message of God and over time it became interpreted as God came down on mount Sinai. Like a game Of telephone and people ended up taking it literally and seriously. There are plenty of lightening storms, not so many mass revelation stories. Why Are There So Few Jews? The Gays - Where Did They All Come From?